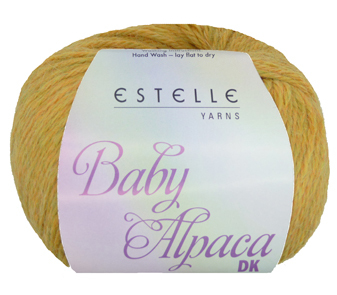 A new yarn just rolled into the Estelle Yarns warehouse, and it has us all incredibly excited! It’s alpaca, it’s incredibly soft, the colours are classic and heathered, and it is a DK weight. Basically… it’s pretty much exactly what every knitter is looking for this time of year as we start to think of the cooler weather. The yarn is by Estelle, and it is called Baby Alpaca DK. We really didn’t want to beat around the bush with this one, so the name tells you everything you need to know! The fibre, the gauge… it’s all right there on the ball band. And as for the quality… Well, that’s a tricky thing to convince you of, unless you touch it yourself. Which we urge you to do! Because once you give a ball of this beautiful yarn a little squeeze, you’ll be sold. So give your local yarn shop a call to see when they will be receiving their shipment of this yarn (it’s in stock now! ), and then be prepared to buy a ball or two (or twenty).